After cleaning out the pantry and freezer in January and serving soup all week last week to sick boys, I am finally back to planning for a "normal" week! 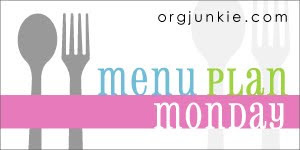 Here's mine...but make sure to go to http://www.orgjunkie.com/ for hundreds more ideas! Thursday: Shane at a meeting so the boys and I will have buffet of leftovers! 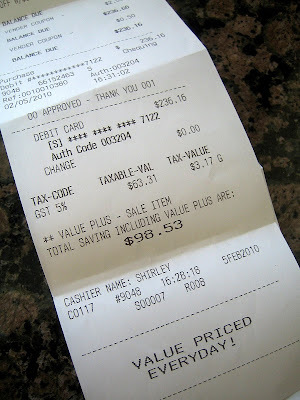 Between the great sale prices, value savings card, gas coupons and vendor coupons, I saved $98.53! Awesome! I even got some free items...just like my money saving friends in the US! For example, Bush's Baked Beans were on sale for $1.00 and I had several $1.00 off coupons. FREE BEANS! It was great watching the total come down and down and down! And yes, I know this is still a very large amount of money, but the pantry and freezer are now once again well stocked after last months Eat From the Freezer cleanout! Wow...it was a bit of a high saving all the money...I can see whay people get "addicted" to couponing! Did you get any great deals this week?